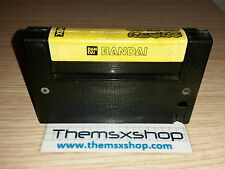 Radarsoft was a Dutch video game developer of the 1980s and released several MSX titles. Their main focus was the Dutch market, so most games are only available in Dutch. Zoo is one of those games and has now been translated to English. The game Zoo was designed by Radarsoft and published for the MSX system by Philips in 1987. It is a point-and-click adventure game where the player has to solve a mystery in a Zoo. Radarsoft was quite active in the Dutch scene, having released games like De grotten van Oberon, Eindeloos, RadX-8, several Topografie games and more. But also utilities like Dynamic Publisher. Recently, another Dutch game, called "Kinderen van de Wind/Les Passagers Du Vent", was translated to English. Now, "Zoo" got the same treatment and has been translated from Dutch to English and French. During the crowd-sourced translation process, an earlier translation by Freesoft was discovered, though this one wasn't up to par with the current translation-level according to "the scene". Check the translation forum topic for the details about the translation process. You can download all versions from MSX Village. This downloadable zip-file contains the Dutch, English (Freesoft), the new English translation & the French version. Or play the new version online at The Filehunter's page. Here, you can even download the game as a .dsk file. The translation package has also been added to the MRC download database. It was fun to participate in this crowd-sourced translation. I'm still wondering though if there wasn't an official English translation of this game, because the official Dutch release does have an English screenshot on its back cover. 404. La page que vous demandez n'existe pas ! Just select the Disk A: logo and select "Save Disk File" and you're good to go. Great work of all involved. I'll submit the .zip package to the MRC d/l db later today.. When admins approve, it's over here. well done everyone! And remember, "handen thuis!" @Samor And yet I try every time..
Mentioning gdx & TheKid in the article could have been an option, but hey, I guess it's preaching to the choir for the most part anyway? Btw (nitpicky): didn't tfh write/submit the news article (as I see ro as author)?